Turkey is an emerging market country with the 17th largest economy in the world ($2.133 Trillion GDP). GDP growth has been strong, averaging 6% CAGR until recently, with concerns over the current account balances and depreciating value of the Turkish lira versus the dollar. This has tempered investor confidence at a time when the economy is dependent on external investment. 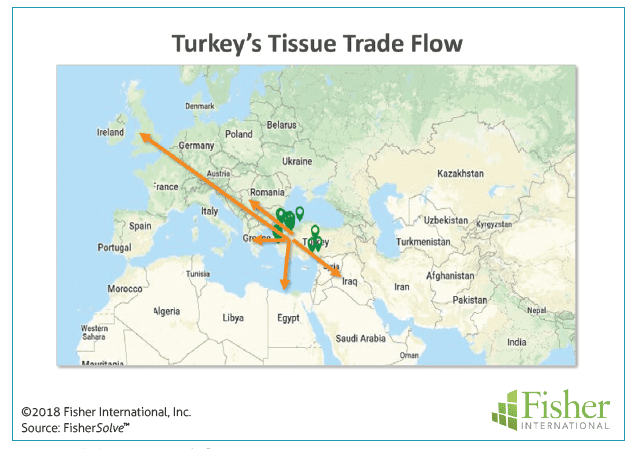 Turkey relies on market pulp imports for tissue production that are subject to cost escalation from currency exchange rates. Turkey’s 2017 population was estimated at 80,845,215, ranking 18th in the world. Population growth has slowed significantly to 0.52% CAGR but tissue consumption per person is estimated to be less than half the average rate in Western Europe resulting in good opportunity for advancement of the domestic tissue industry in spite of slow population growth. From a domestic viewpoint, Turkey is not a unique case in development of its tissue business. 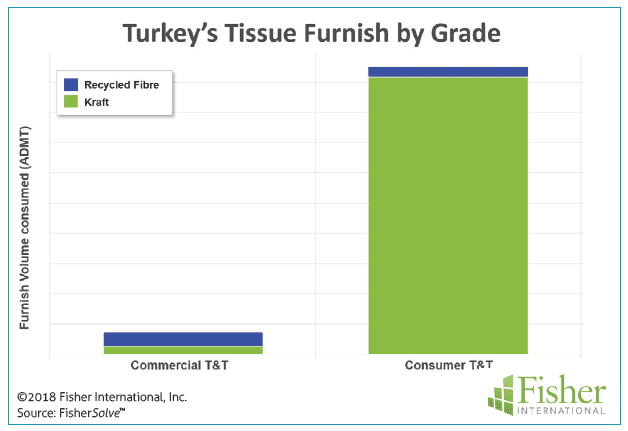 Tissue making represents slightly less than 22% of Turkey’s total paper production. 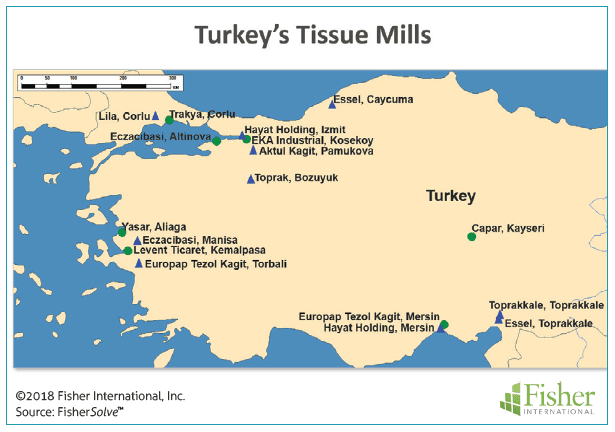 Figure 1 shows the map of Turkey’s tissue mills. There are 13 companies engaged in tissue manufacturing at 17 mills. Most of the sites are in the western half of the country near posts for export. Turkey has added capacity at a CAGR (cumulative average growth rate) of about 11% from 2008 to 2018. 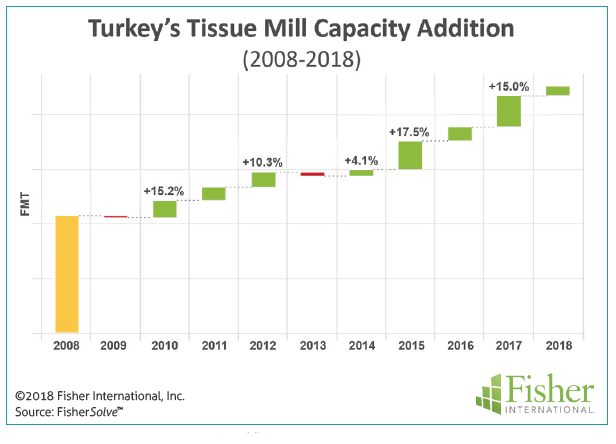 Figure 2 shows this trend and indicates that about half of Turkey’s tissue capacity was added in the past 10 years. This has contributed to improving Turkey’s competitive position and long-term viability within the European region and with its trading partners. The strong competitive position and viability is shown graphically in the bubble chart in Figure 3. The recent capacity additions have resulted in the strong group of large capacity bubbles clustered near the chart origin showing low viability risk and low technical age. 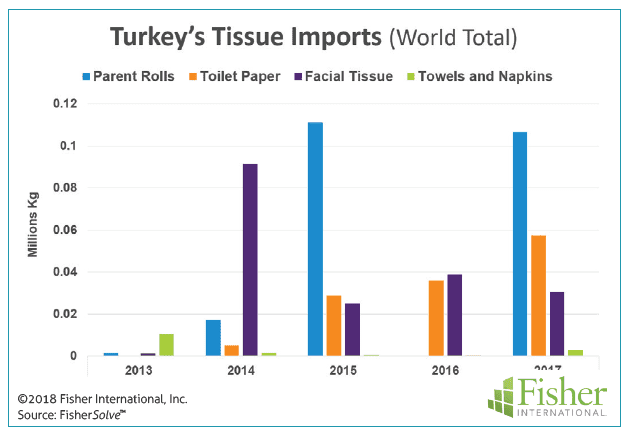 Turkey is dependent on market pulp imports for tissue production. Figure 4 shows that consumer tissue is the overwhelming grade produced for local consumption or export. There is little recycled fibre used in this grade. Commercial tissue does use a significant percentage of recycled fibre, but the overall volume is small. 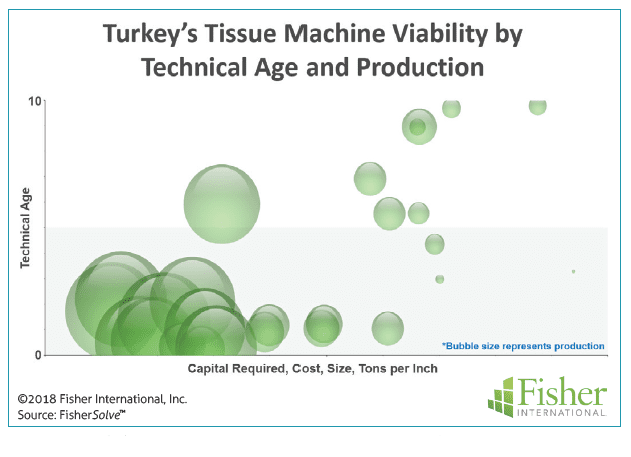 Turkey has a strong tissue business that is well positioned for the future. 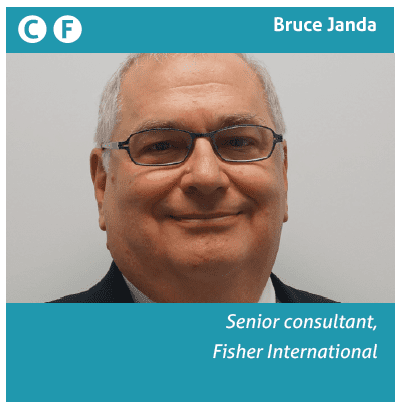 The heavy reliance on imported market pulp is the major risk that exposes the business to trade and currency risks instead of technical issues. However, the domestic environment does not tell the whole story. Turkey’s geography and history offer unique advantages to tissue business development. Turkey straddles Southeastern Europe and Southwestern Asia and borders The Black Sea, The Aegean Sea, and The Mediterranean Sea. As a result, Turkey has been a historic link or bridge in trade between regions and cultures. This linkage has influenced the expansion of Turkey’s tissue business and is expected to play a major role in its future development. Figure 5 shows the central position of Turkey to serve as a trade hub for Europe and Asia. The relative tissue production of European countries is represented by the colour intensity and shows Italy leading Europe in tissue production followed by Germany and Turkey. Comtrade data for Turkey’s tissue trade in kilograms are shown in Figures 6 (Exports) and 7 (Imports). Two key facts are directly visible. 2. Exports of tissue products are about 1,000 times greater than imports. 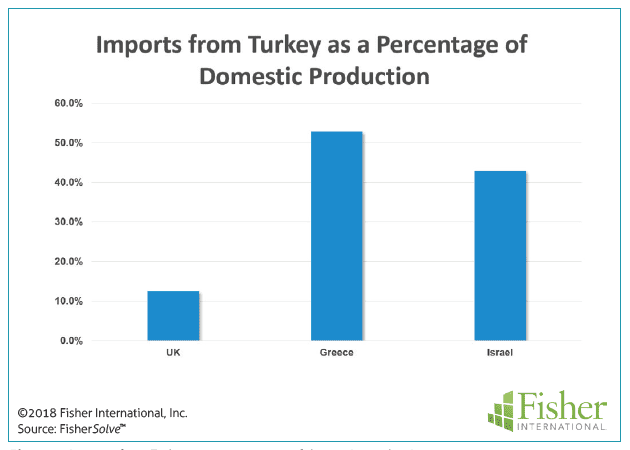 Figure 8 shows that Turkey exports 30% of its production(almost all parent rolls). 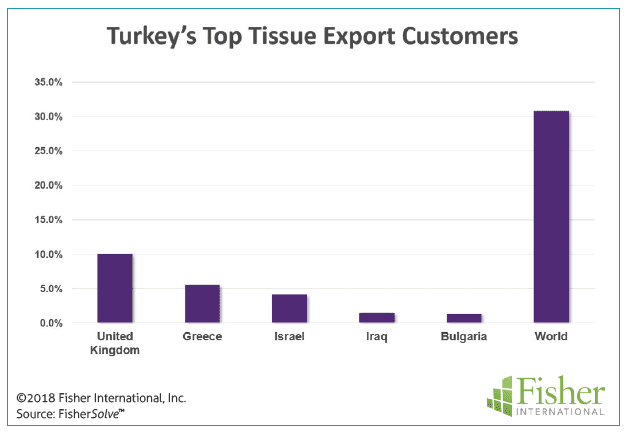 The top five importers of Turkish tissue rolls are the United Kingdom, Greece, Israel, Iraq, and Bulgaria. The United Kingdom is the largest importer at 10% of Turkey’s total production. Figure 9 shows that the United Kingdom is much less dependent on Turkey for tissue supply than Greece or Israel. This suggests that Turkey may have more risk in this relationship than the United Kingdom. Figure 10 shows the key trade flow on the map and the Turkish mills positions. 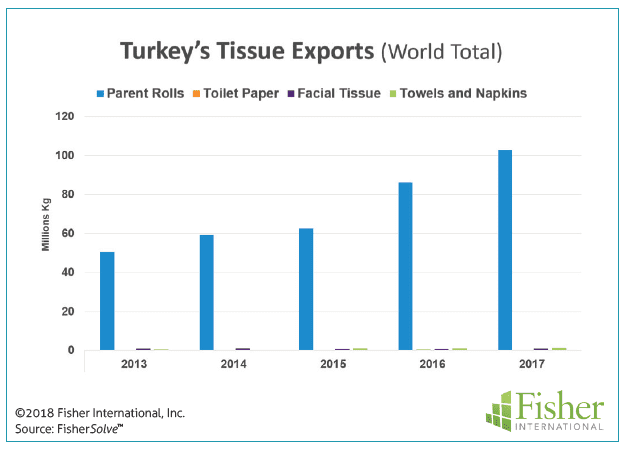 Turkey has made maximum advantage from its geographic position to expand its tissue business. This sets the ground for consideration of future scenarios for Turkey’s tissue business. Being 30% dependent on exports and slow domestic growth, the competitive position of the export business could be a concern. Fisher International’s FisherSolve™ provides advanced tools to evaluate production strengths and weaknesses. Figure 11 is an analysis of Turkey’s tissue business cost position comparing average costs by country for raw materials, chemicals, energy, labour, materials, and overhead. This shows that Turkey ranks in the middle of the pack in its region. Figure 12 provides better future viability than current costs by using the FisherSolve Viability Index. This is a sophisticated tool for understanding the current and future economic health of companies, mills, and production lines. In addition to looking at current costs, this index considers the probability of survival over the long run. This includes the size, technical age and capital required for an asset to remain competitive. In this case, we see that Turkey’s tissue business is considered a moderate risk, but lower risk than most of Europe. 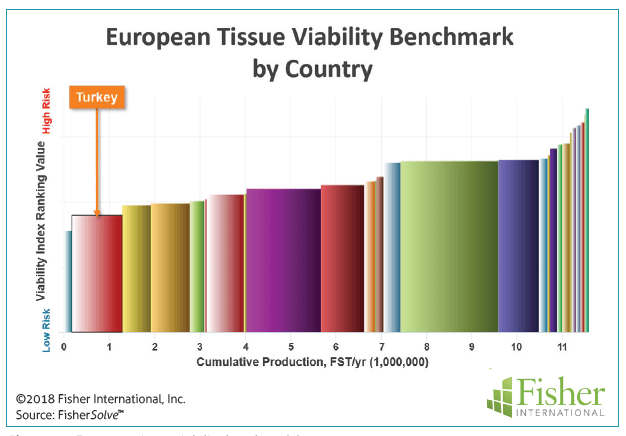 In addition to looking at Turkey’s position within Europe, the viability index can also be used to directly compare the top tissue export customers. 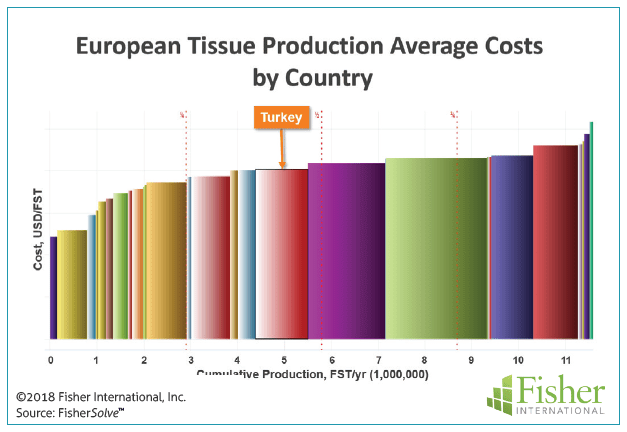 Figure 13 shows the country wide average tissue business viability of Turkey compared to the United Kingdom, Israel, and Greece. In this case, a strong Turkish lira was assumed at about +45% strength versus the U.S. dollar. Under this assumption, Turkey’s viability index improves to low indicating a relatively stronger position as a leader in Europe and with its trading partners. 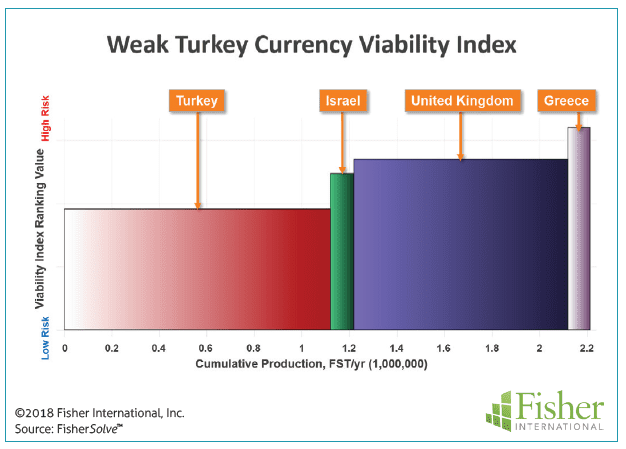 Figure 14 provides the converse case of a weakened Turkish currency by about 45%. 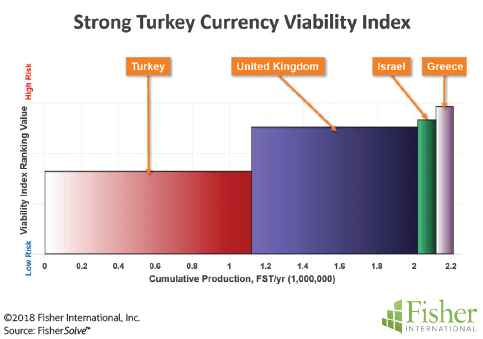 Here we see that Turkey’s viability index moves to the moderate risk ranking and Israel improves its viability versus the United Kingdom. 1. Global trade is under pressure and any additional trade barriers would hurt the parent roll export business. If Turkey were to consume the exported tonnes, what machines would be most at risk for shutdown? A cost and viability ranking of individual mills and machines would provide the data needed to anticipate that scenario. 2. Turkey’s currency is forecasted to weaken. As Turkey mostly depends on imported market pulp, this would have a negative effect considering that pulp prices are already increasing. How will this impact individual mills? 3. The United Kingdom business represents 10% of Turkey’s total tissue production. What will be the impact of Brexit on this business for Turkey? Will trade barriers increase or possibly decrease as both countries are outside the European Union? Will Brexit have a positive impact on the United Kingdom’s domestic tissue business? 4. Is another supplier in a position to displace Turkey in supplying the United Kingdom? Which supplier could threaten to take over Turkey’s position with the United Kingdom? The probable effects of these potential scenarios on specific countries and companies can be modelled by using FisherSolve™ tools at a more detailed level by individual mill and production line. Share the post "Impressive growth potential with tissue consumption at less than half the west European average"